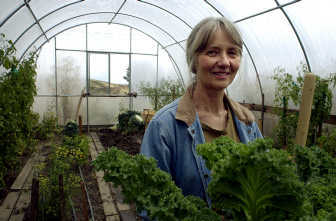 What: MaryJane Butters will speak about sustainable and "green" living at the Spokane City Forum luncheon. When: Wednesday from 11:45 a.m. to 1 p.m.
Where: Spokane First Presbyterian Church, 318 S. Cedar St. Cost: Tickets are $10, which includes lunch. Space is limited. Call: (509) 777-1555 to reserve a spot. She’s got a manuscript due in a couple of weeks, she puts out a magazine and she runs a farm and a bed and breakfast. She’s got a line of easy-to-prepare foods and another of high-quality linens and bath accessories. She sells candles and aprons and hat boxes. For Butters, an all-around lifestyle guru often compared to Martha Stewart, the hectic pace is a bit ironic as she preaches the virtues of simplicity. But, she says, she has no trouble finding peace amidst her sometimes chaotic schedule. Butters will be in Spokane Wednesday, speaking at the City Forum luncheon about “green” living and “how to live an altruistic life,” she says. “Not in terms of whether you can fix the world, but in terms of making yourself feel better and little things you can do,” Butters says. Butters is finishing the final title of her three-book deal with Random House. This one is called, “MaryJane’s Outpost Guidebook for Cultivating Your Inner Wild.” It’s due to be published in June, and it focuses on developing a love of the outdoors – especially for children. This will likely be Butters’ last nonfiction book for a while, she says. Instead, she plans to focus most of her attention on her magazine, MaryJanesFarm. The glossy lifestyle magazine is slated to be re-launched this April and will, for the first time, accept advertisements, she says. Butters is now a proud grandmother to a 1-year-old girl named Stella. She hopes to pass along some of the wisdom from her parents, lessons she credits as the backbone of her success, to the baby.